Originally issued in 1954 and updated in 1961 and 1987, this pioneering study of "small group" conflict and cooperation has long been out-of-print. It is now available, in cloth and paper, with a new introduction by Donald Campbell, and a new postscript by O.J. Harvey. In this famous experiment, one of the earliest in inter-group relationships, two dozen twelve-year-old boys in summer camp were formed into two groups, the Rattlers and the Eagles, and induced first to become militantly ethnocentric, then intensely cooperative. Friction and stereotyping were stimulated by a tug-of-war, by frustrations perceived to be caused by the"out" group, and by separation from the others. Harmony was stimulated by close contact between previously hostile groups and by the introduction of goals that neither group could meet alone. The experiment demonstrated that conflict and enmity between groups can be transformed into cooperation and vice versa and that circumstances, goals, and external manipulation can alter behavior. Some have seen the findings of the experiment as having implications for reduction of hostility among racial and ethnic groups and among nations, while recognizing the difficulty of control of larger groups. Illustrations note 41 illus. 14 tables. 3 figs. 4 graphs. 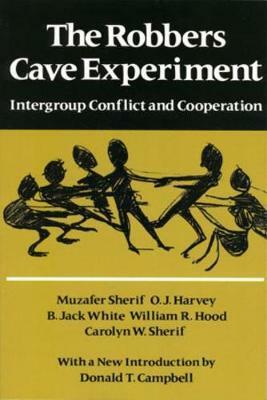 "[The Robbers Cave Experiment] has, in my opinion, achieved the status of a classical investigation in experimental social psychology. . . . [It] represents a valuable contribution to our knowledge in the very complicated field of intergroup relations." --Otto Klineberg "Magnificently conceived and brilliantly carried forward from beginning to end. . . . I do not believe that anyone can escape from the impact of the demonstration." --Gardner Murphy, "Unusual for its effective combination of experimental method in a real life situation with the successful test of important hypotheses." --Ralph H. Turner, [The Robbers Cave Experiment] has, in my opinion, achieved the status of a classical investigation in experimental social psychology. . . . [It] represents a valuable contribution to our knowledge in the very complicated field of intergroup relations. Otto Klineberg" Unusual for its effective combination of experimental method in a real life situation with the successful test of important hypotheses. Ralph H. Turner" Magnificently conceived and brilliantly carried forward from beginning to end. . . . I do not believe that anyone can escape from the impact of the demonstration. Gardner Murphy"
MUZAFER SHERIF was Professor Emeritus of sociology at the University of Pennsylvania.